Zeus, Father of the Olympian Immortals, said, How simple the child. 3000 years later, B. C. Forbes of Forbes magazine fame made the statement, Upon our children - how they are taught - rests the fate - or fortune - of tomorrow s world. Both true, yet spans apart, it is perhaps the very width of this span which best defines the child. Small yet wide-eyed, innocent yet persistent, the source of both our greatest worries and our most passionate joys, They are who they are, could well be the best description yet. 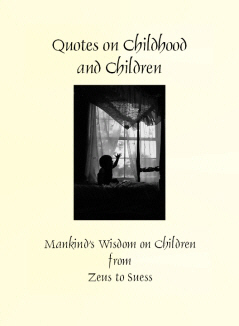 Compiled from the wisdom of 3000 years of recorded history, the one thing which seems certain is that childhood is a special time for the child as well as for the adult. Richer Resources Publications is pleased to add this most recent title to its Greatest Quotes Series of illustrated gift books. This wonderfully illustrated book gives reflection to the joys of childhood and of being a child. Every childhood is unique yet nearly all contain the same aspects of play, imagination and quiet solitude. With every quote, we are reminded of the joys of being a pirate one minute and falling asleep as a prince or princess the next. 48 pages of insightful, heartfelt and inspiring wisdom and illustrations.